There's not much that makes me happier than dipping cubes of bread into warm, melty cheese with good company in the comfort of my own home. It might seem involved, but making cheese fondue at home is actually not much more complicated than melting cheese into wine! All you need are 4 ingredients (+ stuff to dip) and some method of keeping your fondue warm. If you don't want to invest in a full-sized cast iron enamel fondue pot, you can get a personal fondue set or mug for around 15 dollars-- these sets come with a ceramic pot heated by a tea light, a few fondue forks, and are small enough to store easily. Alternatively, you can always keep your fondue warm in a saucepan over a hot plate. Start by prepping all of your dipping foods -- I like toasted bread cubes, boiled baby potatoes, roasted cauliflower, and cubes of apple and pear, but you can use anything dippable that you like. Other than that, all you need for the actual fondue is cheese, wine, cornstarch, and garlic. For the cheese, I'm fond of equal parts Gruyère and another less expensive Swiss cheese, such as Emmentaler. You can really use any combination of Alpine-style or Swiss cheeses (or even American Swiss) depending on your budget and how funky you like your cheese. Plan on anywhere from a quarter pound (for normal people) to half a pound of cheese (for hungry fondue enthusiasts). Grate all your cheese on the coarse side of a box grater and transfer it to a medium-sized bowl. For a pound of cheese, sprinkle over a tablespoon of cornstarch and toss to coat the cheese evenly. Halve the clove of garlic lengthwise and rub the cut sides on the inside of a medium saucepan (non-stick for easier cleaning) and the personal fondue pot. If you're using a full size fondue pot, you can skip some of these steps and do everything directly in the pot. Add 1¼ cup (per pound of cheese) of a dry white wine, such as Chardonnay or Sauvignon Blanc, to the saucepan and bring to a simmer over low heat. Once simmering, add in a handful of cheese and stir in a figure-eight motion until the cheese is completely melted. Continue to add in the cheese handful by handful, stirring the whole time. The cheese and wine may look slightly separated, or your fondue might look a bit liquidy-- don't worry! Continue to stir and cook over low heat for another 5-8 minutes to help it thicken and come together. At this point, light the flame or tea light under your fondue pot, and transfer the cheese into it. If you're using a personal fondue pot, you may not be able to fit all of the fondue at once. In this case, keep the rest of the fondue over very low heat on the stove, and whisk it before transfering to the fondue pot when you're finished with the first round. If you're patient and don't scrape up the bottom too much while you're dipping, you may end up with a thin, golden layer of cheese at the bottom of your fondue pot called "la religieuse, "French for "the nun." If so, you're in luck-- it's as delicious as you'd expect. And that's it. Gather your friends and enjoy! Combine grated cheese and cornstarch in a medium bowl. Rub cut side of garlic on the inside of a medium saucepan. Bring wine to a simmer in the saucepan over low heat. 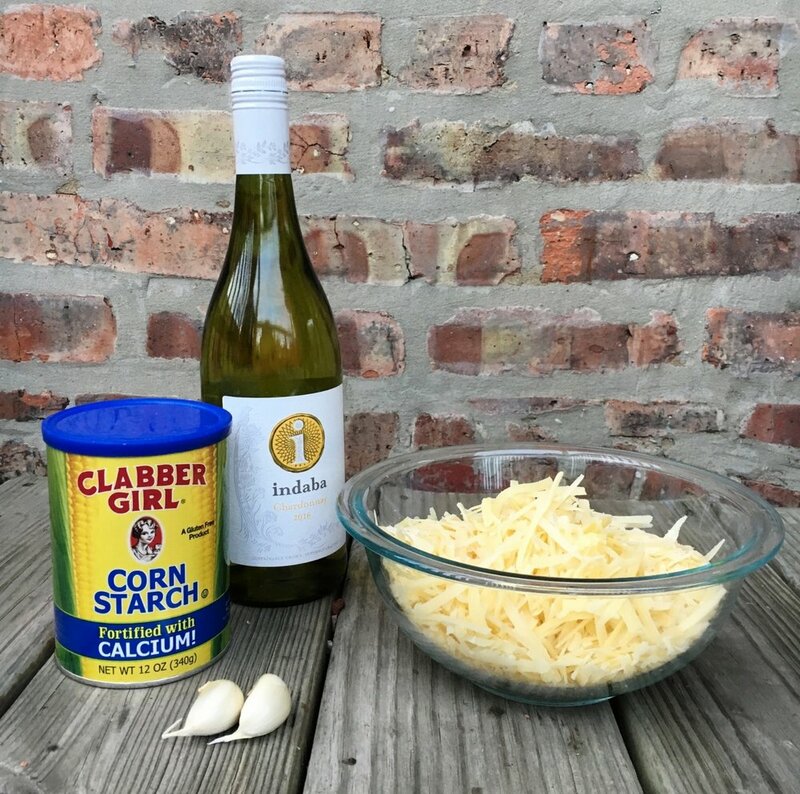 Add cornstarch coated cheese one handful at a time to the wine, stirring in a figure-eight motion and waiting until fully incorporated before the next handful. Cook over low heat for 5-8 minutes more to thicken, stirring continuously. Transfer to a heated fondue pot.